EY’s survey results outline the perils — and potential — of new data sources for insurers. Once futuristic concepts – wearable technology that tracks behavior and promotes healthier living, apps and devices that record driving patterns, in-home and building sensors that monitor environmental conditions, drones and other geographical information systems – have become here-and-now phenomena. While their current adoption is not widespread, early adopters have made clear that these technologies are ready for integration into market value propositions and standard operating procedures. The growing adoption of these technologies — and the usage-based, “pay-as-you-live” business models they enable — confirms that the insurance industry has reached a tipping point. The right bold action can lead to significant value creation in the very near term, while “wait-and-see” delays or insufficient change will leave insurers even more competitively vulnerable. 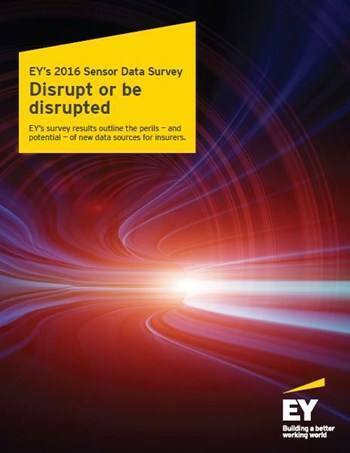 To understand how insurers view the risks and opportunities of sensor data and other new data sources, EY surveyed senior executives from nearly 400 insurers around the globe, as well as 1,400 firms from other sectors, including banking, electronics, retail, telecom, automotive and other sectors. The survey addressed both current practices and plans for tomorrow. The results make clear that forward-looking and top-performing insurance organizations are already innovating with telematics, wearable technology and sensor data, though not to the extent of leaders from other sectors. Why is sensor data so important to insurers in particular? On the strategic front, it presents a clear and compelling opportunity to reengineer the fundamental value proposition through transformative product innovation to benefit customers and shareholders. Of course, non-traditional insurers from outside the industry have similar access to — and in some cases ownership of — these capabilities and technologies, which greatly increases the imminent threat to current insurance leaders.